A small group of species of medium-sized to very large sea snails called Tun Shells. They are distinguished by being large, almost spherical shells that are relatively thin with distinct grooves running around the outside of the shell. Tuns are predatory animals often eating echinoderms (e.g. sea cucumbers ) and other molluscs. 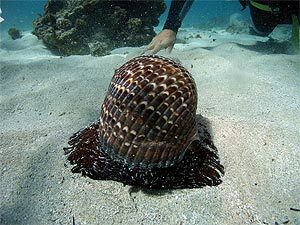 Most Tun shells live buried in sand with only the tip of their siphon exposed. They are rarely seen because of their cryptic habit. They are found in the tropics beyond the edge of the coral reef.